Major averages fell modestly Friday; small caps rallied. Dow -0.4%, S&P 500 Index -0.3%, and Nasdaq -0.2%. For the week, S&P 500 -0.1%; Nasdaq +0.5%, Russell 2000 Index +1.2%. Telecommunications led equity sectors, consumer discretionary also outperformed; technology, utilities underperformed. Treasuries mixed with more curve flattening. 10-year yield -3 basis points (0.03%) to 2.35%. WTI Crude oil jumped 1.5% to $56.55/bbl. due to increased confidence on extension of OPEC production cap at its meeting later this month. U.S. dollar drove COMEX gold 1.4% higher. U.S. stocks little changed to kick off holiday week. European markets higher, trending near session highs. Euro is lower amid political uncertainty in Germany after Angela Merkel’s effort to form a coalition government failed, setting the stage for fresh elections or a new coalition. Germany’s DAX is trading in line with broader market. Asian markets mixed, China equities led regional indexes as Shanghai Composite (+0.3%) rose for first time in five days; Nikkei -0.6%, Hang Seng +0.2%. Commodities – Oil -0.5% to $56.25/bbl. ; gold +0.1% $1293/oz., copper +0.3%. Treasuries little changed; 10-year yield at 2.33%. Solid earnings season in the books. S&P 500 earnings and revenue growth each ticked 0.1% higher over the past week and are now tracking to 8.2% and 5.4% year-over-year increases, respectively. Excluding the hurricane-riddled financials sector, which saw earnings drop 7% on insured losses, overall earnings growth is tracking to a more than 11% year-over-year increase. We discuss earnings season highlights in our latest Weekly Market Commentary due out later today. Strong guidance leads to a rare in-season increase in estimates. Estimates for S&P 500 earnings for the next four quarters dipped 0.1% over the past week but have risen 0.3% since October 1, a rare increase that reflects a generally favorable macroeconomic picture, and the potential for a lift from tax policy changes. More on next year’s earnings outlook coming soon in Outlook 2018. Looking under the surface. The S&P 500 for the week closed down 0.13%, the second consecutive weekly red close after eight consecutive weekly gains. What stands out though is the lack of big drops when the S&P is lower. In fact, it has now been 62 consecutive weeks without a 2% weekly drop for the S&P 500, the longest such streak since 1965. It doesn’t stop there though, as it has been 49 weeks since the last 2% weekly gain – the longest since 1994. We’ve noted many times how rare the action has been in 2017, this is yet another way to show this. 10-year Treasuries yielding 0%? For Japanese investors, the cost of hedging currency risk is becoming increasingly expensive; so much so that once it’s taken into account, the yield advantage of the 10-year U.S. Treasury relative to the 10-year Japanese Government Bond is heading towards 0%. Today on the LPL Research blog we look at the impact of hedging costs on Japanese demand for U.S. Treasuries. The week ahead. The holiday week brings the leading economic index, existing home sales, and domestic durable goods orders and shipments. Speeches from both Fed Chair Yellen and ECB Chief Mario Draghi are on the docket, in addition to the minutes from their last policy meetings. 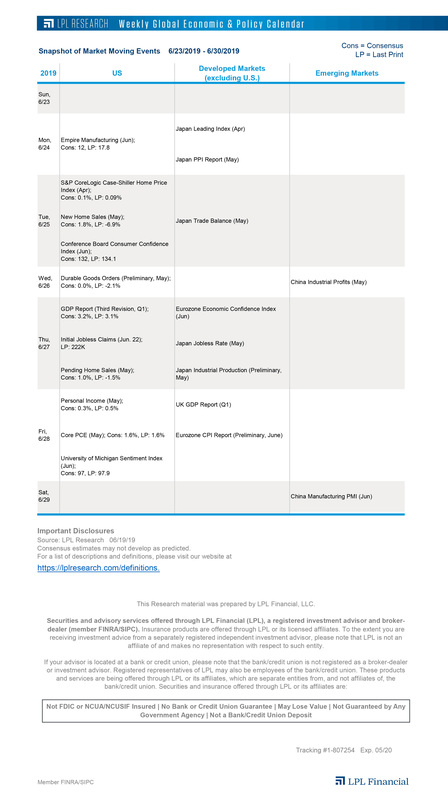 Overseas data includes Q3 gross domestic product (GDP), trade and business sentiment for Germany, Japan trade, and Mexico Q3 GDP; preliminary manufacturing data will be released globally. On the policy front, pushing the Senate tax plan through will remain in focus.